Our world is overwhelmed with soy. It is present in chocolate bars and cakes but also in everyday grocery items like breakfast cereals, bread, or even some hams. You cannot be sure you´re buying a soy-free product unless you read every single label, whether it´s frozen vegetables or a bag of tea. Since 1990s when soy´s popularity rose significantly, it has been added into almost everything you can imagine. Especially soy lecithin can be found in candy bars and pastry due to its emulsification properties which ensure that the particular product sticks together, or in case of dough, that it rises properly. Soy has been perceived as a great part of a daily diet, mainly for vegetarians and vegans for a long time. The breakthrough occurred with the new millennium - the rise of Internet home use and healthy food clan. Mothers stopped breast-feeding and used soy-based formulas, everybody wanted to go vegetarian or vegan for the alleged health benefits, and tofu became the new beef steak of 2000s. Public concern for safety of soy products started with messages about allergies, soy consumption-related cancers, and especially soy´s so-called capability to turn a man into a woman. Since there is always a bit of truth in every claim, you just need to find it in the exaggeration and make your own conclusion. Soy beans contain large amounts of vitamin B spectrum and minerals like manganese, selenium, potassium, magnesium, iron, and calcium. Consuming soy products then means supplying one´s body with vital nutrients already with a small amount. This combination of nutrients is also highly successful in fighting diseases of many types. Although soy hasn´t been proved to prevent cardio-vascular diseases as such, it has been found to lower overall cholesterol and blood pressure. It can also be used in patients with kidney problems because eating soy beans reduces protein in urine. 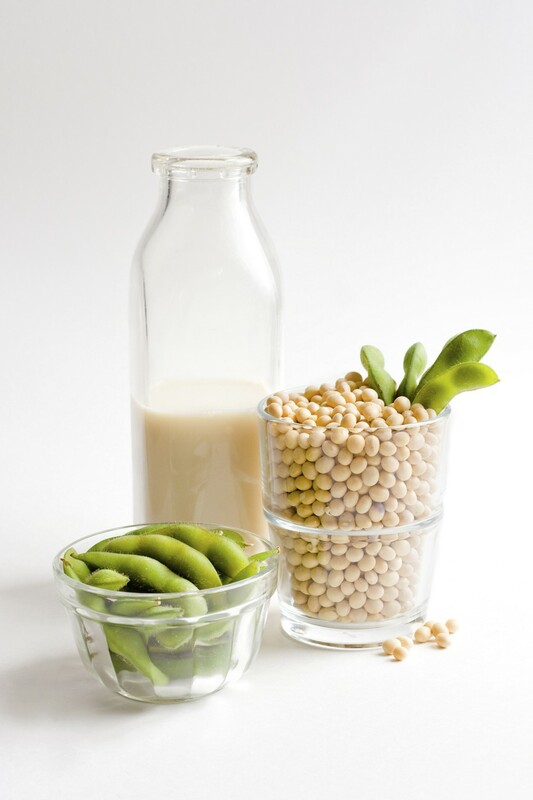 Several studies also state that soy protein given to studied individuals improved their bone mineral density (BMD) which could possibly prevent or decelerate osteoporosis development; however, these experiments have only observed this improvement in menopausal women. That still makes it a great supplement for about half a population though. The majority of soy-product-users are women. One reason for that is that women are simply more conscious about their health and the food they eat than men. They go on diets and try to find foods high in protein but low in carbs and overall calories to lose weight but feel full, and soy is certainly one of them. The calorie content for 100g of soy is 173, containing 10g of carbohydrates from which 6g are fiber, and also 17g of protein. With such qualities, there is no wonder soy is the one food that women choose for weight-loss and healthy living. If you are one of those women, trying to incorporate soy into your daily diet will be very easy. You can use tofu as an alternative to meat in almost any form – fried, sautéed, or as a substitute for ham to put on your toast. There is also soy milk or whipped cream available that can be used instead of dairy products to bake a cheesecake, savor some breakfast pancakes, or just add some soy milk into your latte. For some reason, women are more prone to allergies and that is also a reason why they turn to soy more often. With an increase of allergies and food intolerances, soy can be a good source of nutrients that would otherwise have to be supplemented. It can be used as an alternative to milk and dairy products in cases of cow´s milk protein allergy or lactose intolerance. Lastly, there is one more interesting quality of soy for women, and that is - its high percentage of protein with combination of phytoestrogens helps reduce hot flashes and other symptoms caused by menopause significantly. Are you a middle-aged woman with menopausal problems or allergies? Stay away from medications and rather try some soy milk espresso with a tofu cake. The issue with isoflavones is that on one hand, it can help women relieve symptoms of menopause and make their lives easier, while on the other hand, it can actually cause cancer in them. The study of 48 women divided into two groups, one given 60g of soy protein a day, the other one being on a normal diet found out that after only 14 days, in women who ate soy protein there was a substantial increase of epithelial cells in their breasts, the cells which have the potential to turn to cancer. This kind of study cannot serve as a definite conclusion since it was only observational and on a small number of individuals. However, it would be highly immoral to conduct such experiments on humans with this kind of results. That is why the studies continue on rodents and rats and although they cannot be conclusive because of use of animals, the results state that soy protein can cause cancer. The popular myth that soy can turn men into women has caused a wave of ridicule around the world. It may sound exaggerated to claim that this is what happens but there is actually quite a bit if truth in it. A study of 99 men showed that those who ate most soy in the last 3 months had the smallest number of sperm. However, this is also one of those studies that may be influenced by several other factors and may then not be totally credible. Many researchers believe that excessive use of soy products especially in those allergic to milk or vegetarians and vegans leads to infertility. It can influence both men and women – men by decreased sperm count, their speed and ability to fertilize an egg, and women by an abnormal increase in uterus size or the inability to produce enough estrogen due to over-exposure to phytoestrogens decreasing the natural release of female hormones. On average, soy-fed kids were found to have 17500 times more estrogen in their bodies than breast-fed kids and those who drank cow´s milk formulas. The numbers are terrific when we think about the possible consequences of these babies´ future lives. It was found that babies who were fed a soy-based formula in the first 3 months of life or their mothers ate a lot of soy products in the first trimester of pregnancy have a high risk of developing sexual disorientation and infertility (boys) and early puberty (girls). Such boys can develop woman-like breasts and homosexuality while girls are prone to start puberty and get their first period already at the age of 7. Finally, many of the kids in the study have developed ADHD and are now overweight. We have probably given you quite a shock from reading about the potential dangers of soy. It can be really scary, especially if you already are an excessive consumer of (not fermented) soy products. We are not going to claim that soy is a poison, nor are we going to state the opposite. There certainly are dangers of taking in huge amounts of it at any age, as there are dangers of taking in huge amounts of anything else. The lesson here is to realize that everything has its dark side but it can also give you a lot of value if you know your limit. Our suggestion then is, stay away from soy in any form if you´re pregnant or your baby is less than 2 years old; but don´t be afraid to benefit from its nutritional value, especially if you´re allergic or some kind of vegan/vegetarian/food experimenter. In that case, soy can make your life easier and tastier until you overdo it. It may be quite difficult for you to eliminate soy products from your diet completely, especially if you´ve been consuming them on a daily basis. You may be vegetarian or vegan and feel like without soy, there is not enough variety in your what you eat but that is not the case at all. Think about milk – whatever the reason for excluding the dairy, whether you´re allergic or vegan, there are so many plant-based milk-like drinks that you don´t have to worry at all. In Slovakia you can buy rice milk, oat milk, coconut milk, almond or hazelnut milk and these are available in regular supermarkets. If you go to a specialized store, you can find even quinoa milk, sesame milk, and lots of products containing these alternatives to dairy, such as butter from plant-based sources, various cakes, chocolates, breakfast cereals, bread, whipped cream, or a chocolate spread. If you started eating soy because you´re vegetarian and you wanted to substitute meat for tofu, try using more legumes like peas, lentils, or chickpeas, and make yourself falafel instead of a tofu steak. One thing that is basically impossible to substitute is cheese and we really cannot help you here. If you´re only vegetarian though, you can still eat cheese, and if the problem is cow´s milk´s protein allergy or lactose intolerance, you may still be able to eat products made from goat or sheep´s milk. Finally, as we said before, soy is not a complete no-no, if you only consume it from time to time, it is absolutely OK and you will benefit from it. 3-ingredient recipes – quick, easy, and HEALTHY! Visit any of our Mondieu bistros and relax having a cup of coffee, tea or hot chocolate or having a glass of quality wine. Come see us and enjoy pleasant moments with your friends while having tasty, healthy meals, bio spreads, raw desserts, delicious macrons or unique crepes. Millet and fresh salad lovers will find something for themselves as well. Experience the unforgettable Mondieu atmosphere.